A couple weeks ago, my poor mailman practically got accosted by a wide-eyed, somewhat fanatical woman with a toddler in tow. OK...OK...so it was me! But, in my defense, he was delivering the latest edition of one of my most loved, most used homeschool momma tools...the 2013-2014 Well-Planned Day Planner from Home Educating Family. Upon ripping open the box...yep, I TOTALLY ripped open the package like a crazed addict...I was thrilled to see that not only did the 2013-2014 edition have all my favorite features, but ALSO two new additions that will make planning for next year even better! and weekly schedules for dinner menus and non-homeschooling "to dos"
In addition, this latest planner also touts 2-page monthly calendar spreads with extra large boxes for detailing monthly appointments at a glance AND corresponding side tabs for easy calendar access. Juggling the schedules of seven people every month gets a bit tricky. And although I always color-code my thoughts to save space, the small boxes on last year's ONE-page calendar spreads made it rather difficult to keep it all straight. This year's TWO-page spread gives me twice as much writing room to record doctor's appointments, team practices, and other weekly commitments. One glance at the teacher planners of my local school supply store, proved The Well-Planned Day Planner to be the PERFECT fit for this momma. I, like so many other homeschool moms, have not ONE, but MANY learners. The average planner only has enough lesson plan space for one grade level. This would require me to buy four lesson planners to record the schedules of each of my kids. But, with The Well-Planned Day Planner, I have sections for multiple students. With the introduction of The Well-Planned Day Planner, I've been able to streamline my home management record keeping. Creator and fellow homeschool mom, Rebecca Keliher, compiled the necessary forms and checklists that everyone wearing both the mommy and teacher hat would need throughout the year and put them ALL IN ONE SPOT! The 2013-2014 Well-Planned Day Planner retails for $24.95 plus shipping. Bundle The Well-Planned Day Planner, family wall calendar, and one-year subscription to Home Educating Family Magazine for 30% off. Matching student, highschool, and college planners are also available. For more information, be sure to visit Home Educating Family on Facebook and Twitter or check out my original review. Want to win a planner? Now's your chance to grab your very own copy of the 2013-2014 Well-Planned Day Planner or one of five one year subscriptions to Home Educating Family Magazine...for FREE! Just follow the simple instructions from Rafflecopter. There are several chances to enter. Just click on the +sign for every entry you wish to make. No purchase necessary to win. Must be 18 years old or older and have a US address to enter. Six winners will be randomly selected via Rafflecopter and announced Thursday, June 20, 2013. The winners will be notified by email and will have 72 hours to respond. If emails are not provided or the winners do not respond, the prize(s) will be forfeited and a new winner(s) will be randomly selected. This giveaway is in no way associated with Facebook. *I was given a copy of The Well-Planned Day Planner in exchange for a thorough review. All opinions expressed were true and completely my own. I am not responsible if your experiences vary. I really hope to win, I think this will help me organize both of my children much better! Wow! I have always wanted to try one of these planners. It would be perfect for tracking our school year. Thank you for offering it. The large boxes and ability to track both your personal and school lives in it is perfect. I would totally be better organized with the planner!!! This planner looks awesome! I would love to get my hands on one, all of the features look amazing. Although, I would probably be most excited about the large calendar boxes as that would make it a little easier to write everything down in one place! it would be a great way to see my 3rd graders lessons on the same page as my kindergarteners work and have a list of what housework i need to do. This will be my first official year of home schooling! I think this planner would help keep me sane! Anything to make my day go smoother would be welcomed by this homeschooling momma of 3!!! Would love to win this!We are still trying to figure out the best way to stay organized. I like the big calendar spaces. Hopefully I can organize my whole family with this. These planners look amazing!! Functional and beautiful? Who could ask for anything more- ok well maybe to win one!! Thanks so much for the opportunity!! Scheduling multiple students will be awesome! I like the larger boxes to work with. I have been wanting one of these for myself for a long time. I could really use help planning my homeschool daily activities, and I'm sure my husband would tell you I could also use some help with household management. Having both in one place sounds amazing! I love the weekly lesson plan layout. Usually our curriculum has nice little check list boxes on a grid, but not my old edition. I sure could use a nice pretty planner to organize my year. I would actually love to win the magazine subscriptions, I actually just bought this planner on your recommendation and I love everything it has in it. I haven't filled it in yet and I can't wait to see more about how you do your planning with it. A space for each student?! That sounds awesome!! Being able to record all three kiddos' learning activities in one easy spot is what I'm looking forward to most about this planner! As a side note, I had to click on "a Rafflecopter giveaway" in order to find the entries. Been looking for a good planner and this one may be it! Love the two page spread, with 6 of us in this house that would be very helpful to see everything at once. I would love to win one of these and try it out for the first time! Would be much easier to keep all of the different lists in my life together in one place! The large calendar boxes would be awesome..between my daughter's appointments and all the other extracurricular activies they do. I looked at this at the OCHEC convention and really wanted one. Then a couple weeks later, we lost our home and everything we owned in the tornado that ripped through our street in Moore, OK. I'm glad I hadn't bought one already, and I am hoping to win one now. I know it will help this newbie homeschool mom to separate both my children's different assignments better than my original tactics. I am looking forward to the easy tabs on the side that help me locate each month. Having everything in one location would be SO helpful! I've always wanted to try this planner. Having room for multiple children is my favorite part. How do you pick one? It's the idea of not having 20 different lists around the house that is most appealing!I need all those things! This would be wonderful to win! The larger boxes are my favorite part! 2 page monthly calendar, big boxes, I love it all! I will be new to homeschooling in the fall, plus I run a business from home. I need to be organized & this planner would be a great help. This would be wonderful! I'm working on planning a schedule right now! The 2 page monthly calendar with the large boxes! I think the holiday organizer sounds great. Thanks! I will be homeschooling three kids this next year and could use a planner that allows me to schedule and plan for everyone. I would love to win this since being organized in my homeschooling journey is not always where I succeed. I would love one of these to help organize assignments for multiple kids. I love that there is a month-at-a-glance feature along with weekly planning pages with plenty of room for all my plans as well as a place for a menu planner. I really love it all...and I need to get organized..I Love how it includes our lives as homeschooling mom's. The house, the kids, the curriculum. <3 It makes me feel a sigh of relief just thinking about it..YES! I need one. Where do I click the +5??? I am old school and like to have a schedule on paper not in a phone or computer.....this looks like it is an amazing tool, not to mention it looks pretty too! I like the lesson plan section of the planner! Having it all together will make things much easier! I look forward to their new planners since I started using WPD in 2011! I am excited about the 2-page monthly format! Thanks for sharing this with us! I'd love the cleaning schedule and dinner menu along with the school planner. I would love to have my own copy of this planner. My sister uses it with her children and she loves it! You "had me" when you said that it has homeschool schedule, monthly planner with big enough squares to write in AND meal planner all in one! Because of your review I did just purchase one from their website, but I would also love to win one to gift to my friend who will be starting home school next year for the first time! I love the space for multiple learners. This will be the second year we are homeschooling & I didn't use a planner last year so this sounds fantastic! I've been wanting one for a long time! I like hw it has places for multiple learners. I love all the featues and I know this would be wonderful to win! Thanks for the opportunity! I have to admit, my favorite part is how pretty it is!! I joked when I used it that it was my life, it kept me on track with school work, I used it to log my hours and keep track of appts! Loved it!! The all in one household management. I love this whole planner! I've been wanting one for a while. I just love that it has space for all the many things we homeschool mamas have to keep track of in one place! I have always loved planners ever since college. This would be a great asset to add to homeschooling. I love the menu planning, budget worksheets, and the student and teacher scheduling pages. Love the super organized homeschool planner and that it's changing to a two-page spread calendar! Looking forward to the student and teacher scheduling pages! I'm looking forward to the cleaning schedule. I'm forever trying to find something that works for our family of 6. I think having a spot for 4 kids to plan lessons without having to write out each subject is what I look forward to using the most. I don't know which is better the calendar pages or the multiple learner section! Ill have a first grader and kindergartner in the fall and that would be awesome! I am preparing my self to start homeschooling my kids once we move. I love everything Ihave seen on this planner so Im really hoping to win as it will help a lot! Jumping into homeschooling a 2nd grader and kindergartener at the same time will be challenge enough! I love the idea of having all my planning forms in one place--multiple students, home management, and a master calendar! I've always just made my own planner before in excel. I'd love to see what someone else has designed and have a professional looking planner. I did use one planner from the school store for my two boys this year and BOY did I have to write tiny to fit it all into the planning slots! I would so love to win this and actually have room for the two boys' planned schoolwork! The two page calendar spread also the household management tips! I love how I can have my home planner and school planner all in one. One of my favorite parts it having my weekly menu and things to remember right there in the margin! I like that it helps me organize all my responsibilities in one place! This planner looks GREAT! I love the weekly planner. It's got plenty of room to write in the school work for my kids on one page and I plan weekly meals, etc. How perfect to have it all in one spot! Looks like a great planner! I think I like the home management section the best. It is great to have everything in one planner! I keep wanting to try one of these but haven't done it because I don't want to "waste" the money if I don't like it. Winning it would be the perfect solution! I LOVE how pretty the pages are, and the thought of having everything in one place makes me slightly giddy. i think it would help me tremendously! I totally could use the lesson planning pages. I really need to take some sort of action to really do school "right" for my kids next year. I have been looking at this planner for a long time now and would love it to organize my entire year! As a mom of many learners, I think all the space to schedule our week would be great! I LOVE the bigger boxes. They will be great for all of the things I need to write. There is never enough room. I love that I would be able to keep track of everything all in one place! Fantastic!! I love how it meshes homeschool and life -- the place for adding budget items, lists, etc! I actually just ordered mine! I have been tracking the package and will be attacking my mailman on Monday as well! I would love to have another one though to give a way to a friend! I love the large boxes as well! I also love the perforated grocery lists! I love having room for all my children with all their subjects in the lesson planner portion. Just like you, it drives me nuts looking at regular planners that only handle one subject at a time! This planner looks amazing! Can't wait to get one. Love to win one, I saw them in Homeschool store. Nicely put together. All of it! This will be our first year homeschooling. Love that it has features for both homeschooling and homemaking! I came across your site a few weeks ago and am excited anew about organizing. This planner would help with homeschooling organization and household duties. I love the idea of having it all in one place. I have the 2012-2013 version, and it's wonderful! I love how you can put everything in your life in one place! I love the 4 student scheduling! Actually, I love all of it! Always looking for better ways to stay organized! Now that I have two in school, the space for multiple learners. Thanks! I am looking forward to the multiple learners area the most. I run an in home daycare for children of different ages and it will be so nice not to have multiple calendars for each child/age group. I love that you can have multiple childrens info seperate but together. I love that everything is in one place, and as a new homeschooler I can use all the help I can get! I am really looking forward to the bigger boxes! Having space for a high schooler and a preschooler all in one planner will be great! The high school version I hope will help me keep everything organized for high school credits. I follow you on Pinterest and have emailed you before and just figured out how to follow your blog lol. I feel we share similar values and love many of your ideas. I think that this planner will help my family to become organized. This year starts my first year of officially homeschooling because my oldest son is sadly at the age of kindergarten:( I can't believe how fast they grow! But anyways this book will help me not only to be on task with homeschooling but pretty much every task of my daily life: Dinner preparation, drs appts, homeschooling, cleaning, birthdays, etc. I would love to win this product! Can't wait for your post about co-ops! Hi! This planner is beautiful...and smart! It would definitely make my life much more streamlined & efficient with 5 little ones to schedule! Thanks for the review & giveaway :). This past year we had 3 planners. I would love to consolidate to one. Due to my chronic illness we have to pencil in dr appointments and their activities. It would be nice to have it all in one. I like that everything is in one place because my brain is not! I love that the lesson planner is integrated with the daily household management sheets too! That's going to make it so much easier to juggle the 50 or so things a day that a home school mom has to keep track of! Since I'm new to this whole homeschooling adventure, I'm looking forward to the planner to help keep us organized. I'm the kind of mom who has to write *everything* down or I'll forget. "Mom, can you buy apple cider vinegar?" "Write it down on my list!" I have heard so many good things and would love to win one. I love that it has everything, homeschooling and nonhomeschool. It's an all in one organizer for the year! I love the two page monthly calendar! I would love to use the calendar. This will be our first year homeschooling and I hope to be as prepared as I can be. Ahh I love the family memories page, what a great idea! This planner looks fabulous, it's on my wish list! This planner looks so fabulous! This is pure genius to have everything for home management and lesson planning in one place. I love the ability to plan for more than one child. I love the bigger boxes. I never have enough room to write things down! I would love to give this planner a try just to see if anything will help me be more organized in schooling my children. I am concerned that in being relaxed, they aren't getting enough. I'm not nearly as organized as I dream of being - I start with a loose plan, and get lost in a rabbit trail of my own...sigh. Maybe this would streamline a bit? NIce planner. Hopefully I win!!!! This planner looks wonderful! I like that it includes some home management pages. I've heard lots of wonderful things about this planner, I would love to win one! This planner looks like it would help me organize more than just my life!!! I hope I win!!!! This is it! This is my year! The year of planning and being the ultimate organizer! I've been wanting one of these planners for a couple years now, I hope I win!!! I am most looking forward to just having all my planning in one spot. I am notorious for creating various Word documents and Excel spread sheets only to lose them after working so hard! I can't wait to be super organized next year! I have 7 kids and love that you can have room for more that one child.. much needed in this house! I can't wait to list my lesson plans for each child in the SAME planner! Brilliant! I had been planning to design my own planner to suit our needs, but I would love to win this one instead. Thank you for always pointing us in a strong direction - I am practicing now so I can really get the hang of it by the time my little one is pre-school aged. We're starting now, though he is only two - I figure it's never to early to homeschool - that's the beauty of it. I would love to win one of these. I think being able to schedule our homeschool and cleaning would keep me on track much better. I like the section for meal planning and other household to dos. Have really been wanting this but hubby says just use a notebook and save $25 :) Hope I win!!! I've just discovered your blog and am looking forward to exploring it further. This planner sounds fabulous, and I love that it seems to have an all-in-one feel to it...everything in one place always helps with organization! I would love to win this planner. Maybe it would help me to be more organized. :) Thanks for the giveaway. I love being able to write in a menu,cleaning, and having to write your schedule in one place. I usually scribble on 3 notebook but its a hassle to lug them around. Love this planner! Menu planning, Cleaning, Scheduling, etc all in one place would save me tons of time! I can't wait to use the parent and student scheduler pages the most! I love the household management area! This is just what I'm looking for as we start on our home-school journey! I love that it is an all-in-one planner, everything is in the same place! I look forward to using the month-at-a-glance and weekly planning pages. Plus, I can't wait to allocate the holiday planning pages! I have used this planner for three years now and love it! I would love to win this - thanks for the opportunity. I love the all-in-one feature...home and schooling together. I especially love the large boxes for planning. Thanks for thechance. I love the big spacing to write lots of stuff! Since this is my first year homeschooling (the coming year anyway) I'm sure I'll find every feature equally useful, I need it all! I am most looking forward to having a planner that can contain our school schedule and our life schedule all in one! What I like most about this planner is that it is something I can hold in my hand that doesn't require the internet or electricity! Yes, I'm "old-school" that way. I also like that it can accommodate up to 4 children in one planner; meaning I don't have to try and cram 3 separate lesson plans into one space :). I hope I win! I love planners! The teacher and student planning pages along with the monthly scheduling pages look the most useful to me. Our current system of scheduling and organizing works well, but we have Baby 5 coming in the fall. I have a feeling that having a 6yo, a 5yo, a 3yo, a 15 month old, and a newborn will be stretching my organizational abilities! Having something other than a bunch of sticky notes of to-do lists sounds like it might be VERY helpful in this next stage of family life! Just recently discovered your blog and I love it!! Thanks so much for all the great tips and advice!! I'm going into my 3rd year of homeschooling and finally feel like I have somewhat of an idea as to what I'm doing! Would love to win this planner to help me along!! Ooh, I would love to try this out! Thanks so much for the great giveaway! GREAT giveaway! This planner looks PERFECT in scheduling our busy homeschool day! I like that it is all in one. I have several notebooks and calendars that serve various purposes and I'm always having to cross reference. It is so bee-you-tee-ful! I would LOVE to streamline all my responsibilities! I always try to go for the free printable planners, but life gets in the way sometimes. Having it preprinted would be awesome! I like that it is a household management binder, homeschool planner, and calendar all in one! I love it! Have a nice and organized already put together planner would be a blessing to me! I love how it includes household duties along with homeschool plans. I can never be too organized:) Thanks for the offer. I'd love to win this because I love how it has general household stuff PLUS homeschooling...all in one skinny planner (instead of a bulky binder)! <---there's my reason!! I need to be more organized. This would be great! What a blessing this would be. We're homeschooling a grandson and next year doing our own thing with no text books. This would be super! Thanks for the chance! I love the idea of organizing school, church and family in the same planner! I think this book could be a definite blessing to me! I love the two page spread, and the fact that I could organize school and meal plans and family life all in the same book! I love the time blocks feature for school planning. I normally just plan a sequential schedule, but I think having a length of time established for each subject would be so helpful. I am SO excited about this giveaway! I am excited about how long the day is for writing out the plan! I LOVE that there is a monthly and weekly view....will make more sense for our overall family organization! I am a HUGE planner and this will be our first year homeschooling and I am excited beyond words! Being chosen to receive one of these planners would be such a blessing to me and my family. This will be our second year of homeschooling and we'd love to benefit from the organizational help provided by such a planner. I too really like the size of the space provided for each day. It's hard to fit lessons for three students onto most planners. I think I might be attached at the hip to this little gem. I would love to be able to fit lessons for both of my children in one place. This will be our first year homeschooling & this planner would definitely help me to stay on track! Ah, this looks AMAZING! I love the large calendar boxes and the lined lesson plan pages. Praying very hard for this one! This will be our first year homeschooling and think this would help build a great foundation. I've struggled with homeschooling, but tried to get organized, using different methods. This planner encompasses all that I've been struggling to put together, and puts it in ONE place. Thrilled - I will be buying this if I don't win. Thank you for the thorough review. I'm looking forward to having 2 of my 3 kids planned out again - because that means my youngest is COMING HOME!!!! So I haven't needed to juggle in recent past, and now I will! I'm looking forward to the home organization tools that are included. I also like that I can get a student planner for my older child so that she can start getting involved in her scheduling! I like the size of the planner overall and the room for writing allowed in the boxes for the calendar and lesson plans. I love the 2 page calendar month spread!! To pick the one feature that I like most is too hard. I love having the whole month spread, yet being able to get detailed on the weekly pages. Having my menu for the week right in my planner would be awesome! I could actually keep track of what we eat for the whole year. And a cleaning schedule page...Oh my...such an awesome giveaway. Thanks. The thing I like most about the planner is that all in one household managemnt idea. It would be nice to have everything in one place. I'd love to win the Well Planned Day Planner. Our first year homeschooling and I would LOVE a planner to help! There are so many things to love about this planner but just to name a few I like the big calendar boxes the read aloud /field trip area ,the meal plan area entry for more than one child and the report cards. I would LOVE to win a Well Planned Day Planner to help me be more organized overall but to help in our first year of official homeschooling! I love the idea of the overall month calendar at the beginning - what a great way to see what needs to be done, what has been done, and all you've accomplished. 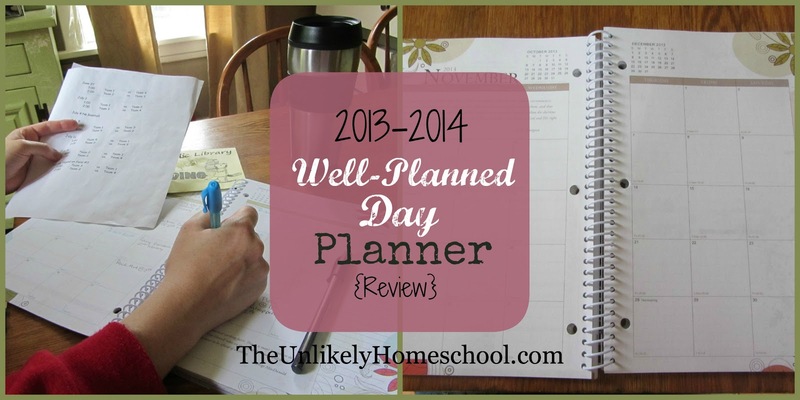 I would love to win a copy of the Well Planned Day Planner. I like the fact that it is an all in one planner, I don't have to have multiple notebooks to plan. I would look forward to using the family memories pages and using the meal planning and budget planning. It would be nice to include our family planning along with curriculum planning in one book! I would love to use one of those and would definitely use the weekly plan feature.